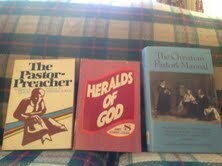 Here are 3 more classic books on the ministry. This Scottish preacher wrote under the pen name John Watson and published several volumes of his sermons. He could be a little sloppy doctrinally, but his viewpoint on preaching was spot on. I can just hear his Scottish brogue as I read. This was the 1896 Yale Lecture. “Cure” sounds like thick Scottish for “Care” ( I read it is actually Latin) and so he writes about the ministry. He begins with forming sermons and he gives good guidance. He explains how when we preach about everything, we really preach about nothing. He says these casual sermons come either from slackness or laziness. Chapters 4 and 5 drag, but be sure to read on as chapters 6 through 9 are exceptionally good. You will smile as he tells about church members who are dissatisfied with everything. He calls them “mutineers” and says “…a ship may weather many storms from without, but mutiny among the crew is destruction.” His solution? Every church should refuse them and they could all get together and make their own church! Since no one would want to pastor them, a pastor who has wrecked two churches “by bad temper and overbearing conduct” could be sought for them. See why these old books can still be so valuable because so much of the ministry never changes! When he speaks of being a prophet versus being an organizer, he sounds like he writes today. He respects and shows the value of small works too. Many ministry books today write that off as failure in these success-mad days we live in. Whether it is call for confidentiality, or the egotism he hears in some public prayers, or the description of the good side of ministry, every preacher should read it. Here is master preacher who gives us his thoughts on the ministry. He discusses the man in the “ministry of the word.” He begins by digging out the meaning of “ministry” and the “word” and describes them as the fundamental conceptions. Then in 4 chapters he compares and contrasts the Apostle, Prophet, Evangelist, and Pastor/Teacher. He sees them as different gifts among those who preach, though there are no more Apostles today. He fills like no one will be gifted in all these areas. He does argue persuasively that pastor and teacher are the same office. In the final four chapters he deals with modern application for these roles he dug out. They are really good. He says that he never asks someone to enter the ministry as the Lord calls Who He wills. Though that call appears different in different personalities, the call is there none the less. He feels the clearest evidence of a call is the gift for it. A Pastor, for example, should have a clear gift for teaching. His epilogue on prayer keeps the true source of power before us. What a gifted preacher he was and it is worth hearing what he has to say. Read more on Morgan here. This title isn’t as known as some, but it should be. This is an abridgment of his The Work of the Ministry, but likely all we need is here. He was a popular author who had a profitable ministry. He has six good chapters on we men in the ministry by reviewing the ministry of the prophets, the Twelve, Paul, and as described by certain epistles. It is well done. In the second half of the book he writes about the work itself. It is very detailed on certain aspects of the ministry like worship, preaching, visiting, Sunday School, and even prayer meetings. This is a very good volume. You can find all posts and books in this series reviewed in the Introductory Post. 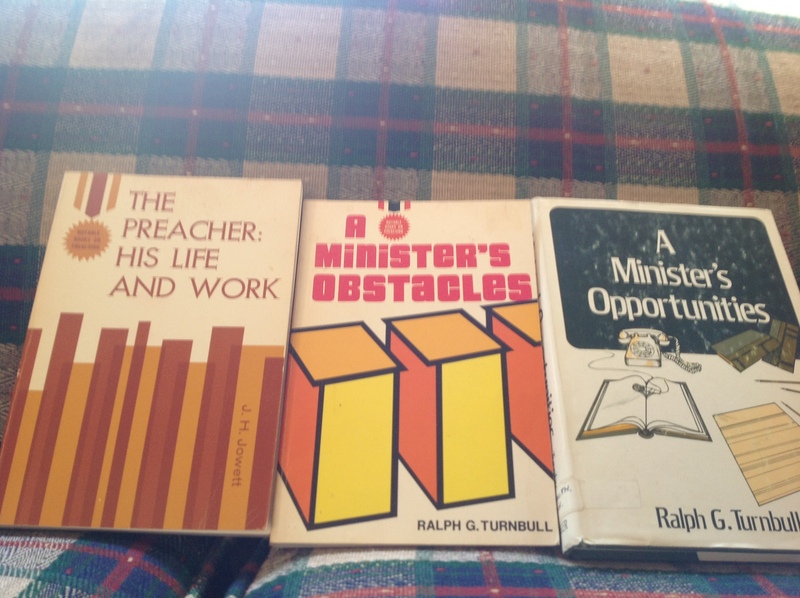 From the treasure trove of great books on ministry, we review three more classics. This he says of what we preach: “So the preacher must know the way to the Hidden Source. He must trail tendencies. He must keep to the main stream; and the rivulets he must pass only giving them a glance….” How that would revolutionize preaching today! He challenges us to be men of prayer or not be a man of God. He also explains that we must be a mystic. We must hear things from above. We must have wonder and imagination. He tells us be but not be consumed with the age we live in, but the ages. He is as powerful in presenting our work with people as equal to our work in preaching. He ends with practical help with various types of visits. This book should be on every pastor’s shelf. Mr. Stewart ministered in Scotland. This volume was originally a Warrick Lecture and is organized around five subjects for the preacher: his world, theme, study, technique, and inner life. We are in this world as a herald of God to people who are disillusioned confused and need to hear of our Lord. We are to smash that disillusionment, he says, with the Cross of Christ. He makes it beautifully clear that Christ must be our theme. We must be careful not to be swallowed by side issues. When he speaks of our study, he encourages us to throw our all into it because of the importance of the message we have to preach. We work with treasure. To better know how to preach to men, better know God. He also makes a powerful plea for expository preaching. As he says, “Let the Bible speak for itself.” He says it will deliver us from monotony. He is right! After giving practical advice on technique, he launches into our inner life. He argues that we must take heed to ourselves before we do so for the flock. This is a reprint originally published in 1826. Soli Deo Gloria and Solid Ground have reprinted this fine volume. Every chapter is written by a different preacher of that era. Some are better than others, but all are good. The chapters may read slightly slower being from that period, but are worth the time. You might enjoy reading one chapter a day and then mulling it over. I especially recommend the chapter on “Pastoral Cautions” by Abraham Booth. These and other chapters remind us again how so many facets of ministry never change through the centuries. Hope you can get these great volumes. Here are three jewels on the ministry. Some are more well known than others, but all are 5-star volumes. Several of these were reprinted by Baker in a series called “Notable Books On Preaching.” If you ever see one of them at a used book sale, by all means pick it up. Jowett was an incredible preacher and this volume made up one of the famous Yale Lectures On Preaching (1911). When I first read this over 10 years ago, the realization came to me just how truly the ministry was work. Particularly, he laid bare the vital truth that preaching is work. Sermon preparation should be intense work. Anything less is unbecoming our great task. His opening chapter puts the importance of our calling in its proper place. Next, he tackles the perils of the preacher. Listen carefully as he speaks of “deadening familiarity with the sublime.” I personally believe this is one of our greatest dangers. In the next chapter on “The Preacher’s Themes” with its emphasis on “feed my sheep”, he points out that we are both responsible and accountable for this very thing. How honest and careful we must be in this task. When he discusses “The Preacher In His Study” he said things like: “We must make the businessman in our congregation feel that we are his peer in labor.” He in no way meant that in show, but in reality. When he gets done you want to roll up your sleeves and run into your study and get going. He goes on to cover our work in the pulpit itself as well as in the homes of our people. When you read these classic volumes on the ministry, you will find an emphasis on being in the homes and lives of the people you pastor. The idea that all visiting should be about getting new people in the church would horrify the old masters who took seriously their role as shepherd. This is a must-have volume! This volume is a perfect follow-up to Jowett’s The Preacher: His Life And Work. Mr. Turnbull wrote this book in 1964 and it was incredibly influential and for good reason. You will notice how widely read he was in the great books on preaching before him. It is no surprise that he edited Baker’s “Notable Books On Preaching” series. His chapter titles alone will grab you. Consider “The Specter of Professionalism”, “The Vice of Sloth”, “The Dry Rot of Covetousness”, “The Bane of Jealousy”, and “The Paralysis of Pride” among others. The contents are as convicting as the titles. He had so many great things to say. I marked in my copy how he even broached the subject of moodiness in preachers and how we must guard against it. This is a great volume! A worthy sequel to his A Minister’s Obstacles. It is set up the same way, but in positive terms. The titles are as riveting and the subject matter needed. He begins with “The Certitude of Vocation.” Again, he wants us to see the task before us. I love what he said here: “If the ministry degenerates to a ‘job’ with demands of monetary returns for services rendered and a tendency to unionize conditions and terms, then the peril of being the hireling and not the shepherd is obvious.” That still speaks to our day. When he addresses “The Stewardship of Time”, he distinguishes the Father’s business and busyness. He challenges us to self discipline and hard work. I love his discussion of study and books, though not everyone gets into that subject as I do. His chapter on “The Power of Ambition” is worth the price of the book. He coaches us to avoid “dreams of grandeur and aggrandizement.” He cautions against being “content with externals and to be careful as “success is a catchword of our secular age.” Thirty years has only deepened the problem. Not quite as influential or good as his earlier volume, but it is worthy acquisition. Happy hunting on the used book sites! I have made it a point since I was called into the ministry to collect the best books on the subject and read them carefully. I scoured recommendation lists everywhere I could find them. Several volumes a year has been my standard fare. The value of these volumes is beyond calculation in their impact on my life. As I have recently ended my first pastorate, and as I anticipate my next ministry, I find myself carefully reevaluating, rereading, and looking for new volumes to help me be what the Lord wants me to be. I remain convinced that the ministry is the highest calling. If that be so, then it is worthy of the greatest effort, the greatest care, and the most intense of study. 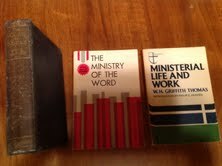 In the beginning I read the classics on the ministry. Hardly any of them were from after 1950. That they were so helpful only proves the timeless nature of the ministry. In recent years I took on newer volumes and found that wonderful things are still being written. The whole spectrum is needed. Many pastors feel that a few good books on any subject or book of the Bible are all that are needed, and while that may work in other categories, it is a huge mistake in the area of the ministry. Gentlemen, it is what we do. Like any other life’s work we should be continuing our education and be aware of what has been said on the subject. Then there is the obvious concern with our lack; our need glares as we go from one blunder to another. Many of these volumes were written by men in the twilight of their ministry as they had the reflection natural as the end is in sight. We readers have the value of their successes and failures forging the words on the page. So I introduce a blog series writing about these great books. I will not be giving them in any particular order. (I can’t—they are boxed and in a mountain of boxes during this transition time in my life). I can only give them as I find them! I write this as I am trying to help myself and thought it might be a blessing to share on this blog. 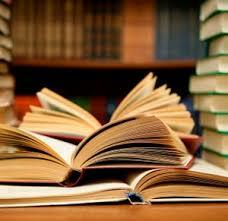 Books on preaching and pastoring will be reviewed. Some volumes push one at the expense of the other, but we can apply the needed balance as we read. I so recommend that everyone in the ministry load up the shelf on ministry books and read carefully. I give it to you as a test. Try it and see if you aren’t helped and blessed immensely. Let’s join together and buck the trend that is destroying the ministry as many are reshaping it as the world pleases. Let’s fight the pressure to change us into entertainers, promoters, and mere organizers when souls are still in the balance and God’s glory is on the line. 29. Walking With The Giants by Warren Wiersbe, 30. Listening To The Giants by Warren Wiersbe, and 31. The Company of the Preachers by David Larsen. Several other volumes are mentioned here. 32. The Expository Method of G. Campbell Morgan by Don Wagner, 33. The Sacred Anointing: The Preaching of Dr. Martyn Lloyd-Jones by Tony Sargent, and 34. Return To Worship by Ron Owens. This book isn’t what you think, though it may likely be what you need. You would imagine that a witch hunt for who should be labeled a legalist would be what you would find, but that is not the case at all. No, what you have is what grace really is and what it could never be. The tone is respectful throughout, but the issue is faced head on. He doesn’t try to ditch the Law of God, but use it as the Lord intends. Here is the irrefutable fact: Christ is the end of the Law for righteousness. Christ, of course, fulfills the Law, but He ends it as a source of righteousness for you and me. Most Christians I know grasp that as it pertains to salvation. The problem is that we think the opposite when we try to live the Christian life. We try to earn God’s favor, we think we must be worthy of His love. The problem is that we are as in need of grace as before. As Mr. Prince so ably points out it can’t be both. You may get to the Lord through grace or the Law–it is one or the other, now and always! Here is his definition of legalism: “the attempt to achieve righteousness with God by keeping a set of rules.” Well, that definition alone makes it folly. 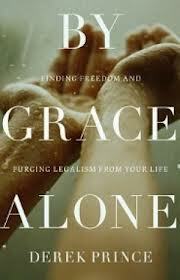 I once believed that legalism was a concept that only applied to salvation, but I was wrong. Like the foolish Galatians, I can go back as a believer and live as an ardent legalist! The purpose of the Law is not for the purpose we use it. A teacher, yes; a deliverer, never. In fact, the Law only brings condemnation. Liberty comes from Christ. He shows how when a Holiness lady, who may love the Lord, doesn’t wear makeup and holds that up as her approval with the Lord, she makes this error. (He kindly never mentions we Independent Baptists who have a few of these ourselves). He does show how this is exactly the same as the orthodox Jew who won’t eat ham. What really makes this book so valuable is how Mr. Prince teaches in the latter chapters how to receive God’s grace in your life and how to apply it. If you have been hearing all the debate about legalism and you are at a loss for how to process the debate, I highly recommend this book. If you just want to straighten out your own thinking, then I recommend it even more.